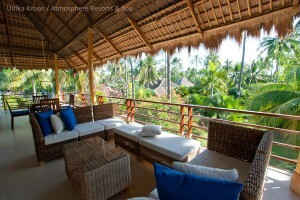 Atmosphere Resort is located thirty minutes south of Dumaguete by car, in the coastal town of Dauin. Dauin is world famous for its amazing macro diving and nearby you also have Apo Island, famous for its wall dives with stunning corals and schooling fish. Atmosphere Resort has a stunning infinity pool that overlooks the ocean and is surrounded by cushioned sun lounges, comfortable sofas and large parasols. Whether you want to scuba dive, indulge in the Sanctuary Spa or simply read a book by the pool, you can look forward to an unforgettable stay at Atmosphere. 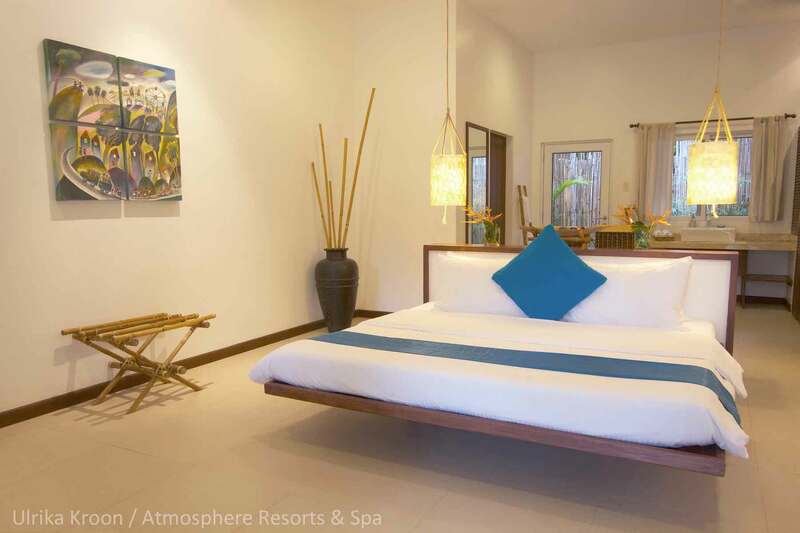 The contemporary style Deluxe Suite Rooms are large spacious rooms with double or twin beds and outdoor tropical bathroom with a rain shower, set within a pocket garden. 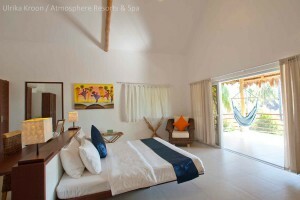 A desk, flat screen TV with DVD-player and wireless internet will keep you connected and with a hammock and couch on the terrace overlooking the lush green gardens, relaxation is a must. A third bed can be made up for an extra fee. Some of the Deluxe Suite Rooms have adjoining doors, which can be opened up and turn two suites into one unit, ideal for families. If you prefer the luxury of a spacious lounge with a dining area, large flat screen TV and a fully fitted kitchen, the Garden Apartment is the perfect choice. Sliding doors take you seamlessly out onto the veranda with its comfortable outdoor lounging area and hammock. Each apartment boasts a separate master bedroom with floor to ceiling picture window looking into your own private pocket garden, its own flat screen TV, complimentary wireless internet and an en-suite modern bathroom. The apartment fits two people comfortably. The two-bedroom Penthouses are Atmosphere’s flagship and most luxurious type of accommodation. The floor area of over 200 square meters allows for a beautiful spacious arrangement comprising of the master bedroom and guest bedroom, both with modern en-suite bathrooms, and an open plan fully-fitted kitchen overlooking a spacious living and dining area. The vast balcony has room for both dining and lounging outside with ample couches, dining table and hammock, and it opens up to both the lounge and the master bedroom. 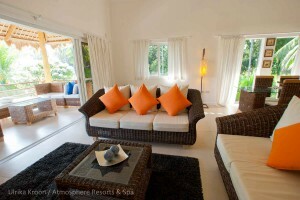 The penthouse fits four people, ideal for a family or two couples traveling together. 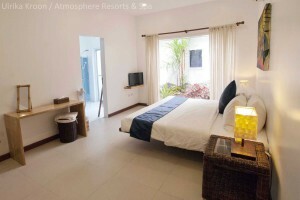 Both the lounge and master bedroom are fitted with a flat screen TV and complimentary wireless internet. The Sanctuary Spa at Atmosphere Resort is set aside in a secret garden where four treatment pavilions nestle discreetly amongst running waterfalls, ponds and tropical plants. 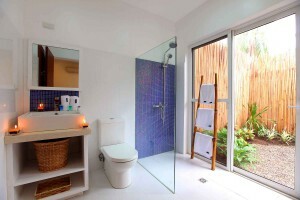 Each pavilion has two massage tables and its own unique bathrooms. Also present in the Spa is a heated pool for Watsu (water shiatsu) treatments. The central Shala is The Sanctuary’s relaxation and reception area where you can recline and read a book to escape the mid-day sun. The spa is open 9am to 10pm and on offer is a wide range of massage therapies, spa treatments, yoga and wellness programs. 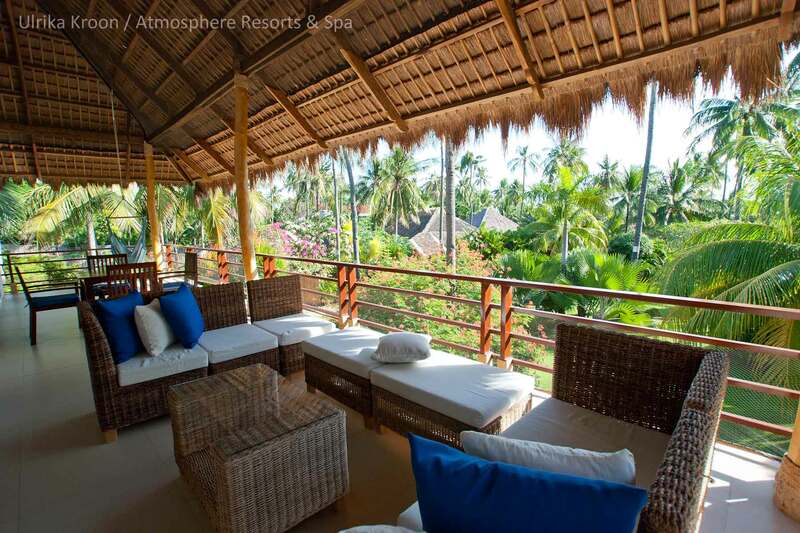 Atmosphere Resort places the utmost importance on the quality of the food and beverage experience and their name is fast becoming synonymous with a quality dining experience within Asia. Atmosphere’s aim is to create a flexible approach to dining which can cater to all your culinary needs. Whether you wish for a romantic dinner on the beach, a seafood barbeque, eating in “Blue” their signature fine dining restaurant or simply relaxing at the bar, the choice is yours. Atmosphere Resort’s spacious dive centre offers a full range of PADI courses in multiple languages, as well as instructor courses, photography courses and marine life presentations. The dive centre features private dive equipment storage spaces, wireless internet, nitrox, camera room, retail boutique, full equipment rental and a spacious briefing area. The camera room has a private work space for each diver and is equipped with power outlets for 110 and 220 volts, towels, air guns and air tight containers for your bits and pieces. Whether a beginner diver, a snorkeler or an experienced underwater photographer, Atmosphere will cater to your every need. 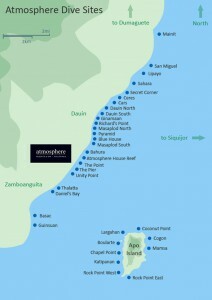 At Atmosphere Resort you can take full advantage of some of the world’s best scuba diving. The world renowned Apo Island with its walls, stunning coral and schooling fish is a short boat ride away. Some of the world’s rarest critters compete for the underwater photographer’s attention along the Dauin coastline where Atmosphere is situated.